The Imixs-Workflow engine supports a multi-level security model for a fine-grained access control on workitems. 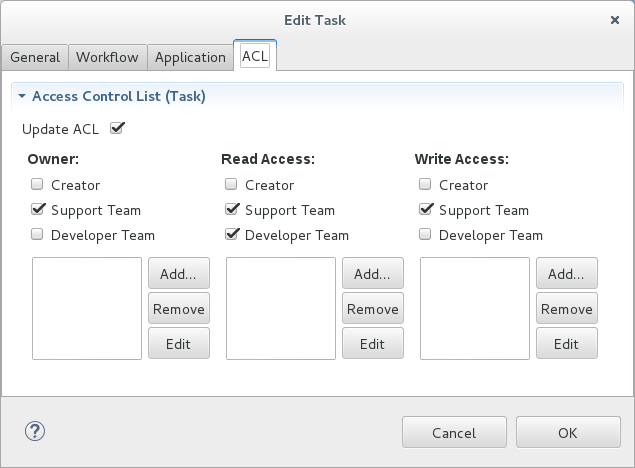 You can define the access control list (ACL), with the help of the BPMN workflow model, for each process state individually. For example, one group of users can be authorized to create and process workitems, while another group is only allowed to read workitems. The ‘Actor Properties’ are defined in the process properties of your workflow model. The access control of Imixs-Workflow is closely coupled to the security concepts the Java Enterprise Platform. So you have various ways to authorize users. See the section Deployment >> Security for more information. The following section describes the core concept how to grant or restrict access for a user interacting with the Imixs-Workflow engine. Users who are assigned to this access level, are authorized to read and write all workitems. AccessLevels assigned to a single workitem are ignored. Users who are assigned to this access level, are authorized to create and process all workitems for which they have read privileges or which do not have a restricted read access. The Authoraccess is the default access level. Users assigned to this access level are only authorized to process workitems in which they are registered as authors and for which they have read permissions. Users who are assigned to this access level, are not allowed to create or process workitems. They are only authorized to read workitems for which they have read permissions or which do not have any read restriction. Users who are assigned to this access level or have none of these roles, are not authorized to interact with the Imixs-Workflow engine at all. It is important to note that a user must have at least read access to a workitem if he or she wants to process this workitem. The following section shows the mapping between different roles that a user owns and his effective access to a protected workitem. A personal workitem means that the workitem is protected by a read/ or write access that the user is assigned to by its name, role or group. A protected workitem means that the workitem is protected by a read/ or write access that the user is not assigned to by its name, role or group. For example, an application can use this exception to display an appropriate error message. To avoid this exception, an application can test the temporary attribute ‘$IsAuthor’. This attribute is computed by the DocumentService immediately after a workitem is loaded. However, if a user with insufficient read access attempts to load a workitem, no AccessDeniedException will be thrown. In this case, the DocumentService returns null. This behavior prevents possible attacks where an attacker tries to randomly spy on protected data.